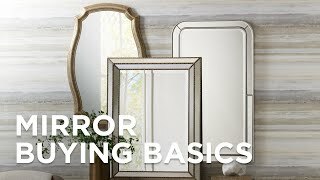 Crisp mirror panes add a new flavor to the classic design of this accent mirror. This Venetian style wall mirror features a frameless design. The beveled trim creates a decorative border for the center pane. Fleur-de-lis accents at top and bottom. This update of a classic design will add style and dimension to any room. Hang weight is 15 lbs. Mirror was shipped and came quickly....perfectly packed. The mirror was even better than it looked in the catalog. Really beautiful mirror with good price. I've placed it in my new bathroom over a 30 inch vanity and it is really impressive looking.. enjoy! The Charlotte wall mirror will enhance your home decor.